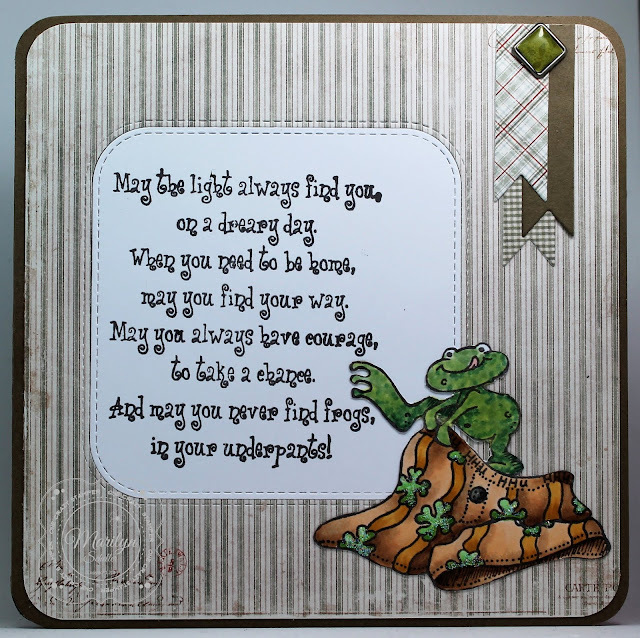 I wish I would have had this card done in time to post for St. Patrick's day because the sentiment and image are perfect! I've had this stamp and sentiment for ages and recently found it and the card worked up so quickly after I coloured and cut out the image. For today's card, I've used another of the newly released clear stamp sets from Rubbernecker Stamps and this one is Lift Off which makes a perfect card for a little guy or girl who loves stars and astrology. These new sets are so cute and contain sentiments and several images. I was also sent the Lift Off Dies which makes cut outs so easy to do. I saw a galaxy background on Pinterest and thought I'd give it a go and after three separate tries, I am finally happy with the result. 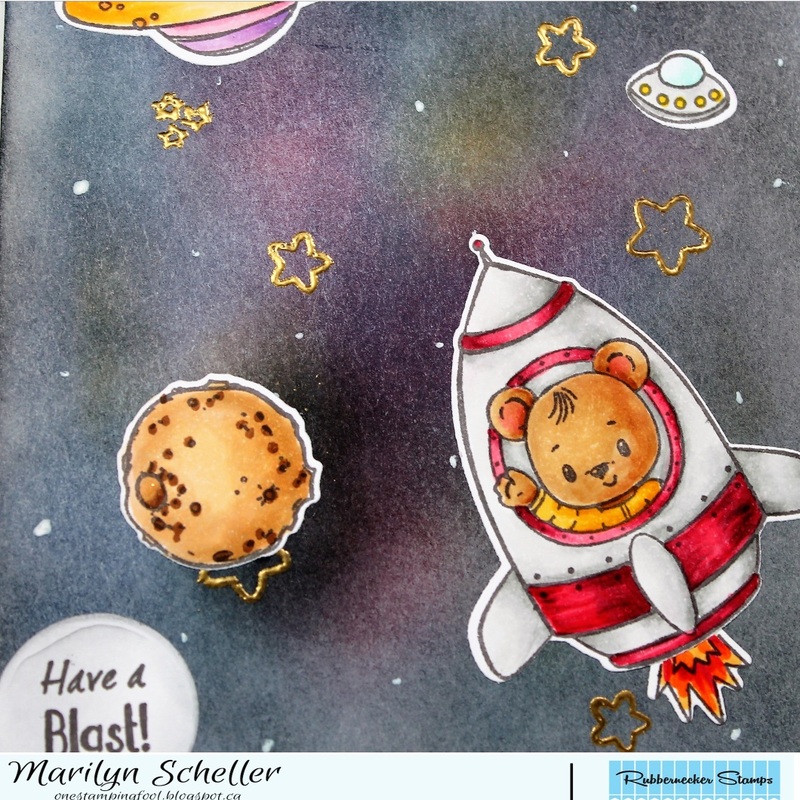 It's easy enough to do if you have a few of the Distress Ink colours. I rubbed in Salty Ocean, Festive Berries and Wild Honey in a swirly pattern onto the white cardstock. Then I added Chipped Sapphire completely over the card base and finally, some Black Soot around the edges to darken it. Then I went in and redid the Salty Ocean, Festive Berries and Wild Honey to brighten it up a bit. 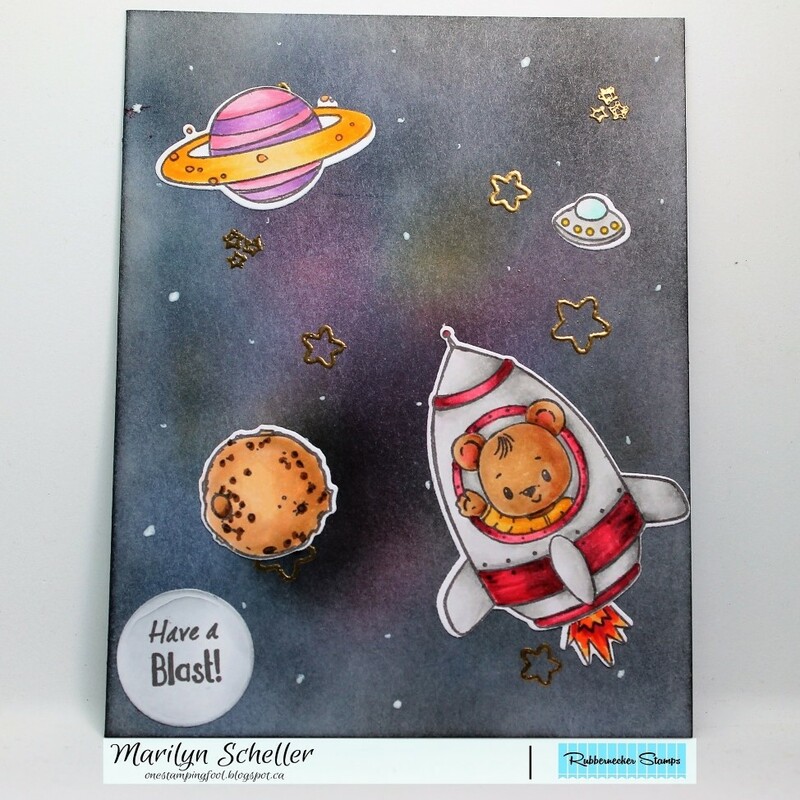 Next step was to use the stars from the Over the Moon set and emboss them onto the background with Wow Gold Embossing Powder. Final step for the background was to add dots with a white gel pen. 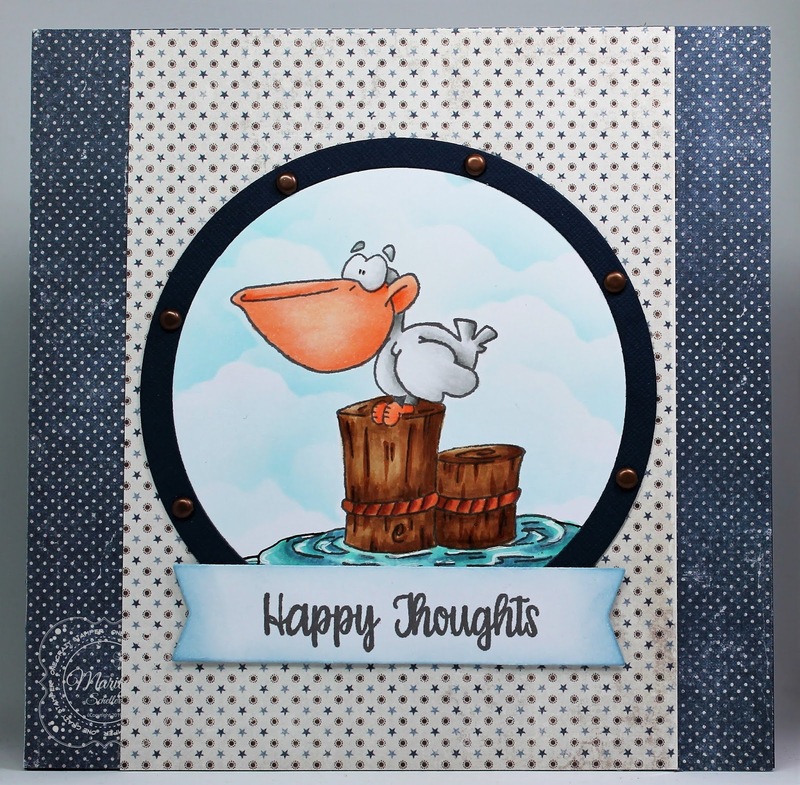 Be sure to check out the Rubbernecker Stamps blog for tons of inspiration and also the Rubbernecker Facebook Page. There is also a Facebook Fan Page with lots of inspiration, updates on sales & product and a great place to post your Rubbernecker Stamps creations and you can find Rubbernecker on Instagram too. Hi there and I hope you are well and getting some warmer weather because spring has definitely sprung here. 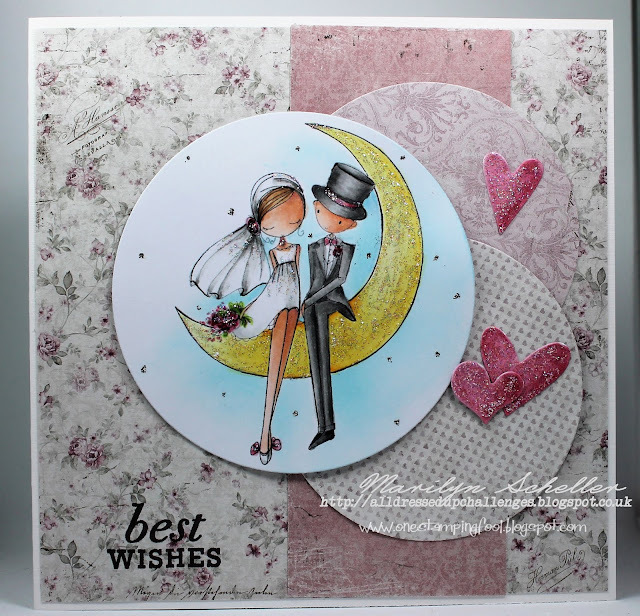 We have a couple of weddings to attend this summer so although it's not like me at all, I thought I would get a head start and get one of my cards done and it works perfectly into the new challenge at the All Dressed Up Challenge Blog which begins today. The theme is always Anything Goes with the only rule to enter being you use an All Dressed Up image. If you don't have any, they can be can either be purchased at the All Dressed Up Etsy Shop or by downloading one of several cute freebies offered on the blog. For my card, I decided to use Over the Moon image which is perfect for one of the wedding cards I need. Be sure to head on over to the All Dressed Up Challenge Blog where you can see all kinds of inspiration from the rest of the girls on the team. Join us for some fun and wonderful creations at the Facebook Fan Page, Facebook Challenge (there is a theme for this one) and there's also a Pinterest page to view some more gorgeousness. Thanks for stopping by and have a good week! Happy as a pig in mud is a saying which must be what these two are grinning about! do a circular card for a change. hahahha... not a big change but it seems like square cards is all I do lately.